We need answers, and divine intervention. soon, I think! And a spiritual awakening and revival? That would be wonderful indeed. Even though it seems we, as a nation, have put God off to the side and have forgotten Him. Even though many of us do not recognize God for the amazing and powerful God that He is. And have reduced Him to an unimportant presence, who shyly begs for our attention. The fabulously good news is that: God has not forgotten us, and He never will…! And because of this, we see much trouble in our culture today. The breakdown of the family, crippling addictions, random acts of horrific violence and economical distress, just to name a few. We have all been affected in one way or the other. But God has not forgotten us, remember that! And He can still bless and redeem our country. How sad for us. And then some ask why, when atrocious things happen. But the answer is plain and simple. Of course things are crazy. We are simply reaping what we have sown as a nation. If right and wrong and good and evil are not important, and if we as a nation believe there is no God, we need not expect nothing less. Our only hope is to return to the biblical truth that we find only in the pages of Scripture. If we want to see our nation turned back to its original condition, then pray! 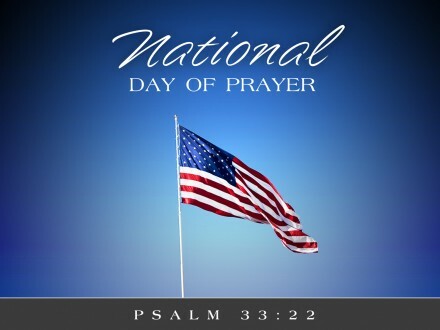 Pray today, on the National Day of Prayer and pray everyday for our wonderful country, which we are all privileged to be a part of.